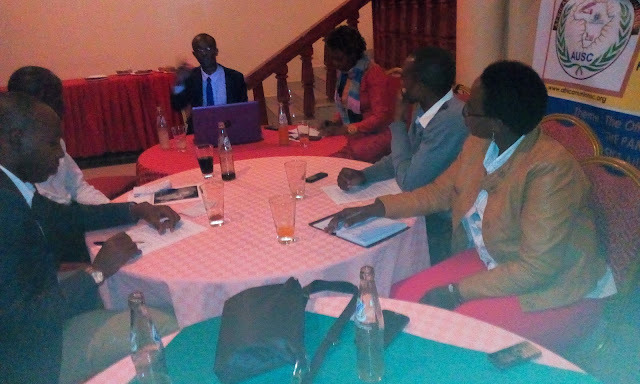 AUSC President Reformed the AUSC International Decentralised Leadership, April 5th, 2017, To Promote AUSC International Action Plan 2016-2019 via ASIDF International Board Membership Adhesion by ALL Current AUSC Leaders. 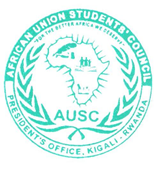 African Union Students' Council (AUSC) "For The Better Africa We Deserve "
Subject: Announcement for Notarizing Adherent Members and Members of Honor of AUSC by the Notary of the Government Of Rwanda. Dear AUSC Leader, friend and Advisor (all). The Office of the President of African Union Students' Council (AUSC) "For The Better Africa We Deserve " would like to deliver this announcement to the public for Notarizing all willing adherent Members and Members of Honor of AUSC by the Notary of the Government Of Rwanda. In fact, dear all AUSC adherent members and members of Honor, the AUSC President's Office wishes to advance with the AUSC Decentralized International Leadership Legalization and Reforming all the International Membership Stractures and to congratulate all our friends of African Union Students' Council who were added in the AUSC by the AUSC President for different purposes including visiting the AUSC 2016-2019 All Leaders and interacting with them, it was a very exciting and excellent experience to have all of AUSC Leaders and Advisors inside AUSC. However, we would love to stay as AUSC Family only to be able to keep discussing internal concerns and thus we are soon going to remove those who were mentioned as non AUSC Leaders for the mentioned purpose ignoring to contribute with their first initial Funds to support the AUSC International Action Plan Activities via joining the ASIDF International Board Membership contributing 120USD for Membership Fees. NB: The Notary of the Government of Rwanda will be soon notifying the AUSC Members who are allowed to keep serving AUSC as Official Appointed AUSC Leaders in all Regions of Africa and Diaspora. Therefore, the AUSC President's Office has appointed different AUSC Leaders and it is time to give all of them the numbers and notify the 1st Notarized Official AUSC Members list involving all Applied and Appointed AUSC Leaders by the AUSC President's Office in Kigali -Rwanda. Other All AUSC Leaders are so called Adherent members of AUSC and Members of Honor of AUSC. Therefore, the Current AUSC Executive Committee in Kigali will revise the files submitted on the AUSC International Communication Office via email :ausc.comminication.office@gmail.com ,and will be calling one by one to determine AUSC Leaders consenting to adhere to the AUSC as official Members to be notarized and receive official documents allowing them to occupy their Previous Post and Position inside AUSC from different Countries across Africa and the African Diaspora. The only thing to be added is that every official document from the Office of The President of AUSC will start to be paid 5USD to the ASIDF International Bank Account including Those Official Appointment Materials that will be issued to all Notarized AUSC Adherent and Members of Honour as mentioned in the current AUSC Notarized Constitution. As well, AUSC will never allow adherent members who have not yet completed their initial Contribution inside ASIDF International Bank Account to become automatically AUSC adherent Members following the Rules Governing AUSC as mentioned in its Current Notarized Constitution. The given deadline for completing the Contribution as members of the ASIDF International Board is April 30th, 2017. Exception is only for AUSC appointed National representatives who are allowed to collect initial Funds from their appointed Zonal, Districts as Clubs Representatives and members of their Offices and will be able to contribute initial fund of 120USD as AUSC National Chapter Office Coordinator allowing his Official Appointment at Notarization of His Name and will proceed to open ASIDF+The Name of his/her Country and save all other Funds as collected from his/her national Members in the Names of AUSC not later than April 30th, 2017. For the Members of AUSC International Committee will be given a period of 12 months to complete their initial Funds of 120USD to the ASIDF Internationals Bank Account to be able to appear on the Notarized List of Adherent Members of the AUSC and Members of Honour of AUSC in order to keep their current International Positions And Titles and failure to contribute at least 10USD Per Month to every AUSC International Committee Leaders from the AUSC Presidential Team members all will lead to the cancellation of the Titles and Position of the leader and his /Her Position and Titles will be advertised for New ASIDF International Board Members Only. The AUSC President's Office now publishes the ASIDF International Bank Account and ASICTB International Bank Account opened in the ECOBANK -RWANDA following the Notarized AUSC Board Resolution Documents allowing the functioning of both Accounts and as mentioned in the previous announcements. You can as well read the below Announcement and share it to any one concerned with AUSC Decentralized International Leadership. Kigali -Rwanda -East African Region. Subject : New Guidelines for Appointing AUSC Clubs Leaders and AUSC National Chapters Director Generals . This is to inform the public and willing participants that the new policy was introduced since the previous Official Launching of the African Students International Development Fund (ASIDF) and African Students International Critical Thinkers Board (ASICTB)about how to become legal AUSC Leaders. Every current AUSC individual leader or any body else who needs to become an officially recognized AUSC Member by Law will have been confirmed through the Notification by the Office of the Notary of the Government of Rwanda for his/her names to appear and be given matriculation number on the new list of Adherent and Members of Honor of African Union Students' Council (AUSC) "For The Better Africa We Deserve " by the AUSC President's Office . Any one who wishes to become a legal leader inside AUSC can start from forming a AUSC Club , and make fund raising of the amount of money with initial sum of US120 to be deposited on the ASIDF Bank account in ECOBANK to obtain the African Students' International Development Fund (ASIDF) International Board Membership and be allowed to start working as Official AUSC Club of and get AUSC International Membership Registration Certificate as the AUSC Club President. Therefore, if that it is the only Officially registered AUSC Club that fulfilled that initial ASIDF contribution in that Country, they will be given the AUSC President's Office go ahead document to become the National Office of AUSC in that country and be given recommendation materials to officially register AUSC Chapter in that Country and use the AUSC Notarized Constitution to guide them on the ways forward and implementation of the AUSC International Action Plan 2016-2019. However, if in one country there are more than one Officially recognized AUSC Clubs Presidents based on the New List of Adherent Members of AUSC confirmed by Notification with The Office of the Notary of The Government Of Rwanda as AUSC Adherent members, the AUSC President's Office will decide on which AUSC Club President can Represent AUSC on National Level as AUSC National Coordinator in That Country . Therefore, following this mentioned above process among the AUSC National Coordinators in each African Region, the AUSC President's Office will decide the AUSC National Chapter which will represent the AUSC Chapters on Regional Level and that National Office selected will become the Legal Recognized AUSC Office of the Representative of that African Region inside the AUSC International Committee. For AUSC Presidential Team, AUSC Diaspora Representatives Team and AUSC Different Affairs Representatives Team, the legal Appointment will be provided to the current AUSC International Committee Leaders only following their confirmed participation in the ASIDF International Board in order to facilitate the ASIDF Members only to fully Lead the AUSC on International Level.